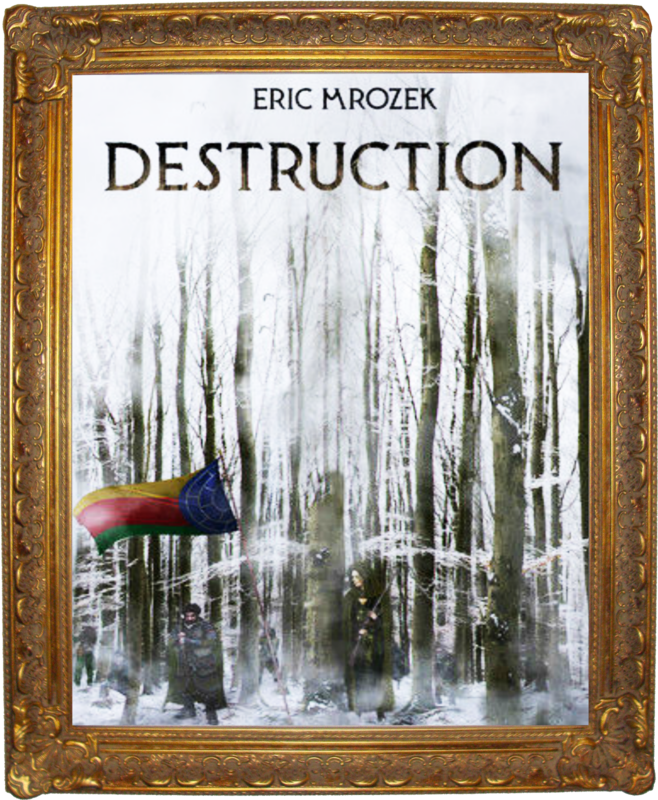 I had the chance to receive Eric Mrozek, author of Destruction for an interview. Here’s my review for his book for those fantasy fan readers ! 1. Welcome to Bookidote! To get to know you better, tell us a little about yourself and your background. I am a 26 year old man that currently works as a businessman and entrepreneur on the Internet in one form or another. I currently reside in Michigan. 2. Have you ever written anything before Destruction? What made you want to start writing this story? This isn’t the first project that I’ve written. Since I was seventeen, I have been developing worlds and refining my writing craft through a wide variety of projects, so Destruction was a natural extension of that. 3.What were your inspirations while writing Destruction? How did you build the fantasy world that Helisah and Aegras live in? Destruction is based around a combination of my study of history and my love of the fantasy genre. When it comes to historical inspiration, the core of the novel is based around the Age of Enlightenment and the early Industrial Revolution, but I also drew from periods before and after that. I knew early on that a move forward to that era would set the novel apart because it allowed me to explore new themes like the rise of democracy, capitalism, and the clash of new and old ideologies. A huge portion of the scenes in the story are influenced by historical events or schools of thought from that time, such as classical liberalism, hedonism, and so on. As for my love of fantasy, that played a role in the novel because I wanted to challenge myself to make a deep and rich world that can please fantasy fans, but I also wanted to make it accessible to the masses. Even with the success of The Lord of the Rings and Game of Thrones, I think that a lot of people are still put off by fantasy because of things like an enormous cast of characters, which can make it a pain (even for me) to figure out what the point of that background character or this detail was and why I should care. It can also lead to fans becoming unsatisfied with the story because it tends to lead to dropped storylines. I thought that the best way to combat that would be to scale it down and make it much more intimate, which is where the concept of a diary came from. 4. I must say that I was quite impressed by the cover illustration! Who designed it? Tell us about the cover and how you came to choose it. The chief cover artist is Hermann Kromer, but some of the pieces on there are modified versions of my own design. I knew from the time that I approached Hermann on the Internet that the cover was going to be a scene from the book, so we developed a more collaborative process that was almost akin to writing a comic book. I would script out the scene and, more often than not, he would create characters like Helisah and Aegras for my approval and put them in there. Sometimes, he would also come up with a new surprise that I knew I had to add, such as the unnamed Telurian Officer with his clock-like face mask. 5. I believe Destruction is the first in a series. What can the readers expect in the next books? I think that Destruction is an exploration of the minds of our heroes and what they are fighting for. Without spoiling anything, the next two books are going to focus primarily on why this war is happening and the continued sacrifices made by the characters. I am working towards a planned ending, so readers will want to look at every little detail from the time that they first open this novel. On top of that, I am currently working on a series of shorter stories to expand the universe in different directions. The piece that I am working on is about the politics behind the beginning of a conflict over five hundred years before the events of Destruction. I intend to alternate between the two series over time to give the public a steady stream of content. 6. We know that books are not made in one day. What was the hardest part of writing this story? I think that the most difficult (and satisfying) part of writing this story was trying to create iconic scenes for the main characters. It’s difficult because you have to get a funny line or an awesome moment just right and base it around their personality. However, it is satisfying when it works because you can laugh with or cheer for the character in a way that you couldn’t before that. 7. Who are your favourite authors? I’ve read books that range from Voltaire to the present day, so it’s really hard to pick a favorite among them. I would say that the biggest influences on me right now include: J.R.R. Tolkien, Robert J. Sawyer, and Harry Turtledove. They all write quite differently, but their work points out that you have to capture every detail from the wider universe (Tolkien) to the characters and their personality quirks (Sawyer/Turtledove). 8. If you could be the original author of any book, what would it have been and why? I don’t want to be too arrogant here, but I would have to say… mine. If you think about it, it is exactly my style of writing. 9. Hahha well said. And what advice would you give to your younger self? Think of alternate ways to tell a story beyond book form and harness the power of the Internet to make your dreams happen. 10. Finally, what advice would you give to aspiring writers? Keep writing, develop a thick skin, and don’t publish until it’s polished to a mirror shine. If you want to keep track of Eric’s future projects, visit his blog here ! Thank you to the author himself for sending us the Avanced Review Copy of this book, the paperback once it was published and taking the time to answer our questions. You can purchase a copy of Destruction by clicking here !